I’ll be honest that Brussels sprouts were on the list of green veggies that I tried my very best to stay away from growing up. My mom didn’t care for them, so I got out easy. That is until a good friend of mine (a James Beard nominated chef that doesn’t take no for an answer) decided I was not going one more day without trying one. She made me a plate and I reluctantly tried the tiny little cabbage-looking vegetable I feared. 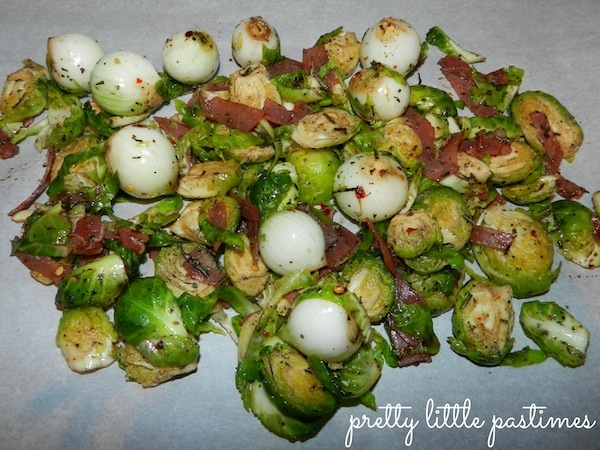 Like many foods she has proved me wrong about, the Brussels sprouts were more than just eatable, they were tasty! 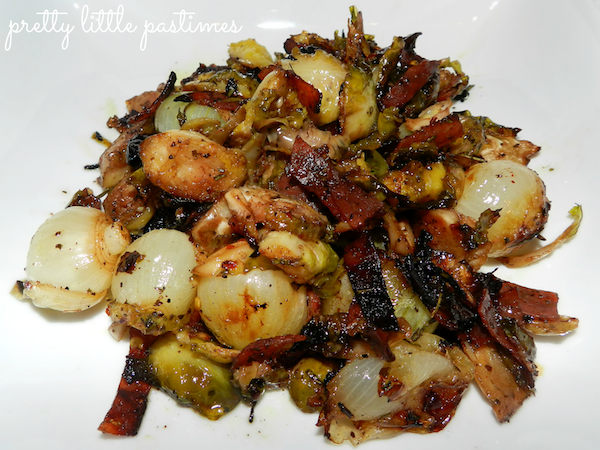 I wanted to share my version of Roasted Brussels Sprouts hoping that it might inspire a few more you to give them a try. When shopping for Brussels sprouts, look for the smallest, freshest you can find. These tend to be sweeter and more tender than larger ones. Before cooking, trim the stems and discard any damaged or discolored leaves. Next, cut the sprouts in half (lengthwise); this will speed up the cooking time. Blasting the halved sprouts in a hot oven will caramelize the edges and bring out their sweetness. It also significantly shrinks them, so don’t be surprised when you pull them out of the oven! I decided to add pearl onions to this dish, because I just love their subtly-sweet onion flavor, especially when paired with balsamic. To prepare the onions for roasting, soak them in warm water for 5 minutes. Remove the onions and discard the skin and trim the roots. Preheat oven to 450 degrees. Toss all ingredients together and spread out in an even layer on a baking pan. I always line my pan with parchment paper for easy clean up, but if you don’t reserve a little warm water to deglaze the pan at the end. Roast the Brussels sprouts for 20-25 minutes or until the sprouts are brown on the edges and tender, stirring halfway through. Remove from the oven and serve warm. These roasted Brussels sprouts will make a wonderful sweet and spicy side dish to add to your dinner. I am definitely thankful that I was coaxed forced to try them. Enjoy!